This long post is a round-up of interviews that the cast and crew have partaken in upcoming to the Christmas Special, sorted by person. Snippets have been taken from Non-BBC sources so make sure to click on the links to read the full interview. So can you set the scene for this year's festive special, Last Christmas? "It's a rather clever episode because it's incredibly festive and jolly, but also quite terrifying. I'd say it's one of the scariest Christmas adventures ever. 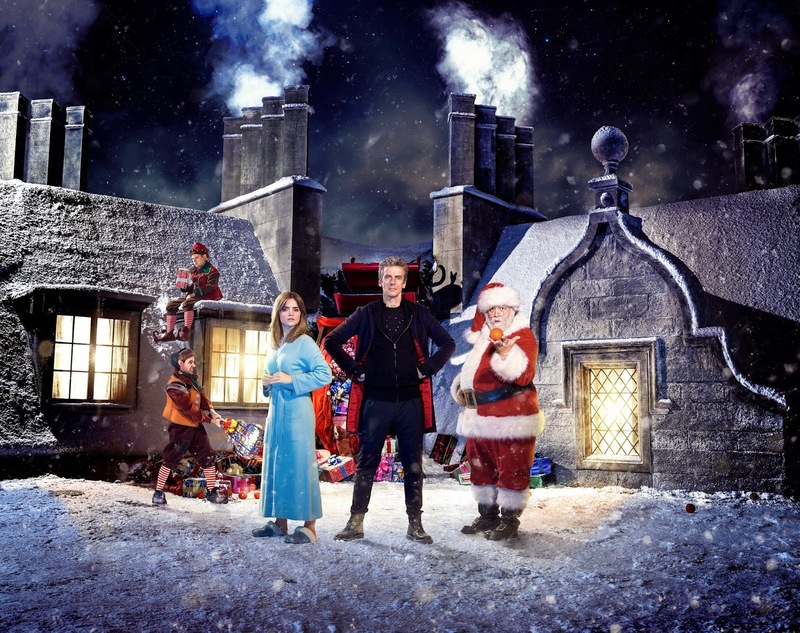 Santa has crashed into Clara Oswald's roof so he's there with his elves, but while this might otherwise be an excuse for cheer and happiness it's actually a nightmarish development, and only the Doctor knows why! So the Doctor has to arrive there, too, to save Clara from what Santa being there means for her life!" Will Santa survive?! Surely he can't be killed off! "Kids will be glad to know that Santa will remain intact by the end of the show. He's not a Santa robot or Santa alien or anything sci-fi like that! He's the real genuine Santa Claus!" The Doctor and Santa Claus have a past history don't they? "Yes, because the Doctor is slightly competitive with any semi-mythical characters and it's the same with Santa. The Doctor probably thinks Santa's had things to himself for too long." What was it like working with Nick Frost playing Santa? "It was just fabulous and he was a brilliant Santa. I'm not an actor who usually suffers much from corpsing, but Nick made me laugh and giggle so much on set. He knows how bad I was getting with him there so he deliberately provoked it in me! There's lots of out-takes of me hiding behind monsters and such like! Nick's great because he brings a great deal of jollity and fun to that role - and he's very convincing as Santa Claus." Does the Doctor's relationship with Clara change at all in this Christmas special? "Oh yes. She's fabulous, but yes there's something quite profound that happens to her in this story... but of course I can't go into that." Michael Troughton stars in this adventure as a scientist on the base that's under attack by Sleepers and Dream Crabs. Was there an inevitable discussion about his dad, Patrick, who played The Doctor from 1966 to 1970. "Of course, and mainly because I was a huge fan of his dad. In fact, I had his autograph. I wrote a fan letter to his dad, and he sent me a little snapshot of himself on his boat and autographed that with a Biro. I remember really cherishing that because it was such a personal thing. I spoke to Michael a lot about his dad and of course he looks bit like his dad too. Michael and I had worked together before, and he had some very interesting stories." This is the 10th Doctor Who Christmas special. As an old-school fan does it seem strange to you that the show has become such a big part of Christmas TV tradition now? "It does, and it has fitted into family traditions too. I've always insisted on watching it. It's terrifying that it's now in that 'Morecambe & Wise' slot as it were. But it just shows how this show has expanded and become so popular among families that it works so well on Christmas Day. It's got that very British mix of something a little scary and something festive. It's like the tradition of having a Christmassy ghost story." Has your Doctor stopped evolving yet? Is he now how he's always going to be? "I think it would be wrong to say he's 'arrived' now. And that's certainly not how I feel. That would be lazy, and a bit foolish! I think you have to keep moving him on because in a way if he's regenerated he's still learning about himself, such as how he responds to the universe and the world, so I think he probably will be different again when he comes back for the next series. So how might The Doctor change in the new series? "It's inevitable I suppose when you play Doctor Who, that your first season has to be a direct contrast with the previous Doctors. And that's worked well with my age and curmudgeonliness against Matt's youth. I'm just finding out who this character is and also there are more mysteries about him, so it's good to hint at those. There are other things in my Doctor that we're still to display." "I think they’ve worked together for hundreds of years, potentially. He’s just really tired of them. And they’re back-chatting him all the time. He just gets cross sometimes because Santa wants the last word or some kind of cool sentence, and they just undercut him, constantly. And within earshot too.I think he’s really tried of them but he’s very protective towards them. He’s their boss essentially. I’ve enjoyed working with those two [Nathan McMullen and Dan Starkey]. There’s lots of improvisations in terms of things we whisper and physical ticks. It’s nice to work that in and have the freedom to be able to do that.We shot a scene yesterday on top of Clara’s house. Bear in mind it took them about six weeks to build the set for a day’s shoot. It’s absolutely amazing and it looked amazing." How does it feel not be playing someone who’s not Strax in Doctor Who? It was great actually. It’s very interesting. With Strax the make-up is much more extreme and I can’t really hear - I have to do a lot of homework before I get on set! [Laughs] And also, Strax usually has a couple of gags each scene and I have to make sure I land those in quite a specific way.But because I can react to people normally, you can see my face, it’s been much more loose. It’s been fun. The first day was like, “Ah, this is my actual face on camera! [Laughs] What am I doing? [Laughs] Obviously with Strax’s face it’s a mask that I have to almost choreograph. I have to to tilt because he’s very difficult to light because of his deep brow ridge and his eyes disappear quite easily.With this, ‘cos it’s my face, theoretically it’s a lot more easy to manipulate! [Laughs] It’s been great to have that opportunity. After seven years in a rubber suit it’s quite freeing - having just an hour in make up rather than three. It’s been lovely.I think I’d mentioned to Andy Pryor [Doctor Who’s casting guru] at some function or other and he reassured me that, “We’re always thinking about getting you on board but it would be something that was appropriate.” At one point, we thought, during The Snowmen, we thought we could have a crowd scene perhaps with Neve [McIntosh, who plays Vastra] and I as a slightly mismatched couple in the background. Has Steven written this part, playing to your strengths? I think he’s aware of what I can do, certainly. It’s a slightly more comic character, perhaps. As you can imagine Christmas elves with ears like this [points to his impressive prosthetic ears], it’s not going to be deep Stanislavski [laughs]. I suppose, after a while, writers have a voice in their head and they’re aware of what you can do. What was it like to work with Nick Frost and how does he portray Santa? I was a bit star-struck, to be honest. For the first time with anyone that I've worked with. I grew up watching Spaced and Shaun Of The Dead and Hot Fuzz. At the readthrough, I had no idea who the rest of the cast were. I was the first one there and went to find my name, and then looked to my right and seen Nick Frost ['s name] and I was like, "The, THE Nick Frost? Is there another actor called Nick Frost? Is this him???" [Laughs] He entered the room and I kind of had tunnel vision.He's probably the most iconic Santa I can think of. Obviously, there's a lot of Santa films, but he brings that little bit of comedy and the little bit of something different. I think it'll kind of be the one that you remember most.It might [grinning] involve a sleigh that gets crashed into a roof top and that's how we discover Santa being a little bit careless. Did you get to working closely with Peter Capaldi and Jenna Coleman whilst filming? Yeah. Most of our scenes are with them but essentially on this polar base where we find ourselves, the elves and Santa usually turned up on one side of the set and Peter and Jenna were on the other. The last scene that we filmed was on a roof top and we were very much in close proximity them and finally managed to spend a bit more time with them. Working with the Doctor and Jenna who plays Clara so well was very enjoyable.I texted Karla [Crome, Jess in Misfits] just to catch up and told her I was filming the Doctor Who Christmas Special in a couple of weeks. And it kind of went silent. I didn't hear back for a few hours. then she plucked up the courage to reply, "I hate you! I wanna be in that!" [Laughs]I'm looking forward to everybody else sitting down on Christmas Day and watching.It's definitely up there in my career - I enjoyed working on Misfits but to be involved in something so iconic, with the following that Doctor Who brings, I'm very proud of this achievement. "There's less swearing and it's less crude than Misfits," laughs Nathan (left). "Santa and his elves are a team and look out for each other. But you can tell they spend a lot of time together - they've done a lot of journeys to a lot of houses! But they become unlikely heroes. "This adventure sees Santa visiting a sci-fi polar base, then trying to save the day because he's called upon. It's not, 'Who Ya Gonna call, The Ghostbusters?' On Christmas day it's got to be Santa..."Nathan says he particularly enjoyed The Wolf's elf costume and pointy ears, especially wearing the huge elf-like shoes. "When I went to the costume fitting I was half expecting a bit of green Lycra and some sort of a tacky costume - but it's one of the best costume fittings I've been to. Usually it's jeans and trainers for me, or a Misfits orange jump suit, but this time it's a character that has its own identity. As soon as you put it on, you are the elf. "I'm hoping to take the elf shoes home with me! They engulfed my foot and were extremely comfortable. When I was filming I FaceTimed my daughter, Sadie, who's nearly two, and the first thing she said was 'Shoes!'"